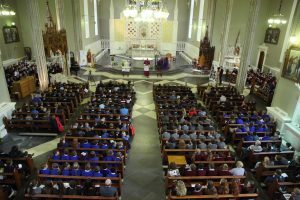 There were more than 700 children present in Carlow Cathedral on Friday for a celebration of the tenth National Day of Prayer for Children, organised by the Society of Missionary Children. The society, which is Pope Francis’s official children’s charity for overseas missions, aims to provide spiritual support to children, through prayer, to work towards transforming the world into a better place. Through prayer, sacrifice and offerings, young people are encouraged to become more aware of the plight of the less well-off, particularly living in poorer mission countries. The charity organises the national day of prayer on the second Friday of October, which is ‘Mission Month’ in the Irish Church. Mission Month is organised to raise awareness in this country about the evangelising work of Irish missionaries abroad and to also raise funds to support their work. As part of the day of prayer for children, across the country, schools organised events for children to participate in the day by celebrating Mass or by reciting the Mission Rosary, while a headline event was held at Carlow’s Cathedral of the Assumption. In his homily, Bishop Denis Nulty of Kildare and Leighlin, noted that there was a set of multi-coloured Missionary Rosary Beads in the sanctuary space of the cathedral and he explained the colours as follows: ‘Green representing Africa; Red representing the Americas; White representing Europe, Blue representing Oceania and Yellow representing Asia’. He told those present: “We are privileged to live in a society and a world that values education, let us in this month of October support through our prayer and fund-raising the parts of our world where children so badly need the opportunity education offers.” The bishop quoted a remark by Pope Francis on the nature of education, which he compared to learning to walk – ‘one foot firmly anchoring us on the ground, the second taking the risk of landing in a new space’. Bishop Denis Nulty slicing a celebratory cake in Carlow where the National Day of Prayer for Children was celebrated (Pic John McElroy). After the Mass, green, red, white, blue and yellow balloons – representing the colours of the Mission Rosary beads – were released from the grounds of the cathedral. This symbolised, said the bishop, a reaching out with the missionary message of joy! 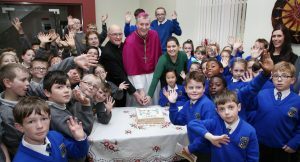 There was a cake specially baked for the occasion — though from the picture taken by John McElroy, we reckon Bishop Nulty had a hard time ensuring everyone got a slice!